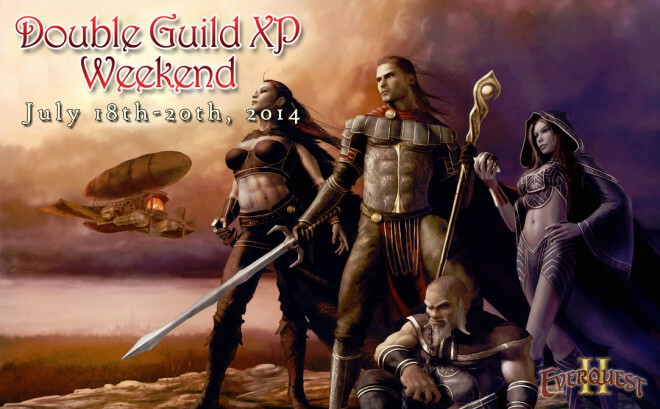 As announced on this week’s EQ2 Insider webcast, this is a Double Guild XP Weekend! The event will run through 11:59pm Sunday night Pacific Daylight time. EQ2 characters who complete writs, tradeskill work orders, completing certain quests, kill certain NPCs, or turn in status items receive Personal Status on their Character. 10% of that amount is also given to the character’s guild. For this Double Guild XP weekend, that amount doubles to 20%! Note that there is a rare Legends of Norrath-looted item which increases your normal amount to 11%. It’s unknown if that stacks this weekend. Today’s EQ2 Insider Episode #3 is now available for watching on YouTube. You can read our summary of the webcast here. Bonus XP and “Gear Up! Level Up!” Extended! Yesterday, on EverQuest II Insider, the EverQuest II Development Team announced that they are having a double experience weekend for All Access members from Friday, July 11th, 2014 at 12:00 PM PDT until Sunday, July 13th, 2014 at 11:59 PM PDT! This will include adventure, AA and tradeskill experience. In the future, we’ll run more double bonus experience weekends of different types, so stay tuned! Also, the Development Team heard your cries for an extension on the much loved “Gear Up! Level Up!” goodness, so they have extended it throughout the month of July! This means it’ll end on Thursday, July 31st, 2014 at 11:59 PM PDT, so take advantage of the offer while it lasts! What does this offer entail? From the just-finished EQ2Insider livecast (of which you can read our transcript here), Holly “Windstalker” Longdale confirmed two exciting bits of news. First, Double Etyma has been extended through the end of July. 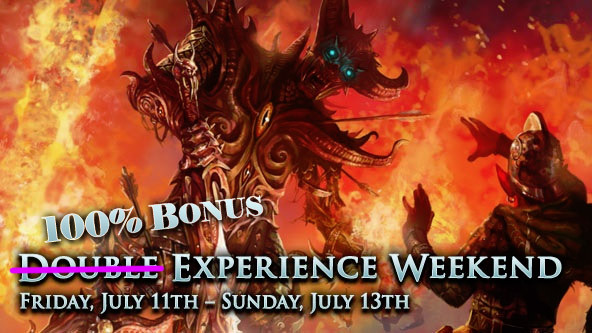 Second, the upcoming weekend will be a Bonus XP weekend from July 11 at noon until Sunday night at midnight. Don’t forget! Today (7/9/2014) from 2:00 PM – 3:00 PM PDT at Twitch.TV/ EverQuest2 we’ll be doing our LIVE July Q&A EverQuest II Insider episode! We’ve compiled your questions from the forums, Facebook, Twitter, and Google Plus! Can’t make it? Don’t worry! It’ll be up on our YouTube shortly after, so be sure to subscribe to us over there! On today’s show will be EQ2 Community Manager Margaret “Luperza” Krohn, EQ2 Producer Holly “Windstalker” Longdale, EQ2 Game Designer Mike “Xelgad” Ganz, and EQ2 Lead Designer Kyle “Kander” Vallee. According to Holly “Windstalker” Longdale, this July 4th weekend will not see Double XP as we’ve seen in past years (EQ is having one this year), however we will see a 40% rebate for selected StationCash items. Hopefully the sale will include “service” items such as Character Slots, Spell Research, Age of Discovery features like Mercenaries, or Server Transfers, but we’re not holding our breath. No Double XP this weekend, but there will be one very soon ™. We have a big 40% sale this weekend. 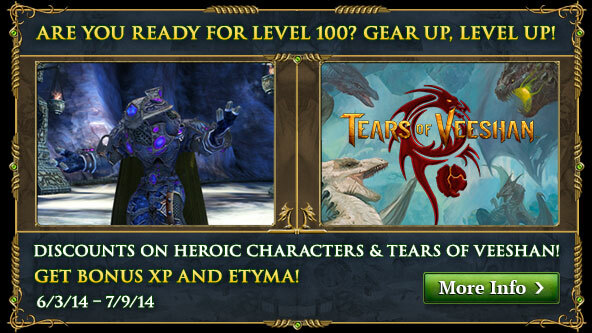 This is also the last weekend of the Gear Up, Get Ready where members are getting bonus XP. Just saying. 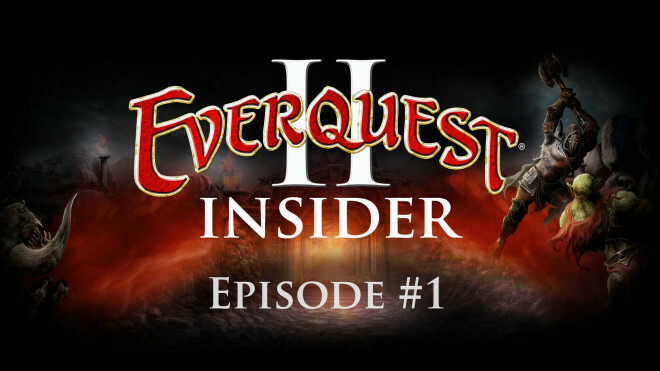 EverQuest II Insider: Episode #2 Airs Tomorrow! Cast: Margaret Krohn, Jason Woerner, Holy Longdale, Akil Hooper, Kyle Vallee, and Nathan McCall! News, Announcements and What’s New? Dev Picks: Submit your house here for a chance to be spotlighted! Dev Showcases: Showing off the new NPCs for decorators, Deathtoll updates and new NPC reveal for the expansion! SOE Live Dev Team Rapid Q&A: Holly Longdale and Akil Hooper will each have 2 minutes to answer as many questions as they can! Who do you think can answer the most? If you have a question, send it to us on Twitter, Facebook, Google Plus, or right here on the forums! How do I get my Guild, Fan Site, In-game Event, House, or a Friend featured on EQ2Insider? Head over to the What Is EverQuest II Insider? thread and fill out one of the forms on the page. I hope you won’t forget your favorite EQ2 fansites — EQ2U and EQ2Wire! Last month on the first episode of EverQuest II Insider, the EverQuest II Development Team announced that we are working on a new expansion, and we’ll be increasing the level cap to ONE HUNDRED! To help everyone prepare, on Tuesday, June 3rd at 9:00 AM PDT, we are launching the much awaited “Gear Up, Level Up” promotion that was announced in Holly Longdale’s May/June Producer’s Letter. What does this entail? EverQuest II Insider #1 on Twitch — Early Access to Quests/Zones, EQ2 Roadmap, What’s Coming Soon! On Wednesday, April 2nd, 2014 at 2:00 PM PDT, EQ2’s new community manager Margaret “Luperza” Krohn (aka PurrfectStorm), hosted the first EverQuest II Insider livecast on Twitch. This 1 hour broadcast included EQ brand manager Adam Key, Holly “Windstalker” Longdale, Akil “Lyndro” Hooper, Chris Garlick, Gary Daugherty, and Nathan “Kaitheel” McCall. Alas, a recording of the livecast was not preserved either by SOE or Twitch (due to a settings glitch), so this episode joins Doctor Who and other vital shows as missing presumed wiped. Holly and Akil talked about current topics including Bristlebane Day, as well as previewing some Player Studio items that will be coming soon, including a very nice looking yacht or fishing boat with oars and other gear. Luperza mentioned that Player Studio topics will be covered in their own livesteam. We got to hear the ‘April Fool’s intro music’ (archived for posterity on Zam) and the new meatbeast vid was also shown (if you haven’t seen it then look here). All Access players will get access to new zones / heritage quests 1-2 weeks earlier than other players. Those with new All Access account will have double xp weekends. More All-Access exclusive items on the loyalty merchants. The schedule for updates will be more public so that we can see how Smokejumper’s weekly/monthly update idea is working. EverQuest II Roadmap/Blueprint — Upcoming plans for EQ2 with feedback from players. Player Studio will open up (later this year) to submissions from Germany, UK, France for players with an SOE Station account. Developer picks for Housing Leaderboards — returning soon. 10 More AA points (requires level 95)– next week. Thanks to Sambril, Kinya of Babagra Polish EQ2 fansite, and Errrorr for their note-taking! 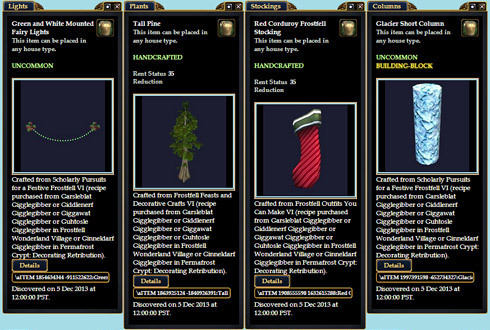 Bristlebane Day went live last week, and the ever-reliable EQ2 ZAM and EQ2 Traders were on hand to provide detailed updated guides to ensure that players don’t miss out on any of the fun, including any new additions for 2014. Bristlebane Day returns tomorrow, Friday, March 28th, and runs through Thursday, April 10th. There’s new recipes, new rewards, and a new event currency! Keep your eye out for interesting Patchcraft mobs all over Norrath and earn your Patchcraft Slayer achievements! All your favorites from last year return, some with new rewards. On April 1st things really get hopping! New this year… bunnies. Everywhere, bunnies. You may have been stumbling over them around the world, and on April 1st you can collect them for three new achievements. Returning are the Jester’s superior gardensin Enchanted Lands, giving harvestables from all holidays. Frostfell crafting stations will also pop up in Enchanted Lands on the Highest of Silly Days. There are two quests offered exclusively on April Fool’s Day, so you’d best like riddles if you want to add to your dice collection! Bristlebane Day event starts on 3/28! Corrected an issue that was causing some spells to ignore wards. Klandicar and Zlandicar should no longer heal from non-player kills. Zlandicar’s spell “Necrotic Evisceration” can now trigger reactive spells. Klandicar’s spell “Cognitive Evisceration” can now trigger reactive spells. Klandicar’s spell “Chaos Storm I” has been changed to “Chaos Bolt I” and can no longer be area effect blocked. Klandicar’s spell “Chaos Bolt I” can now trigger reactive spells. Merig, Harin, Gerid’s spell “Commanding Leadership” can now trigger reactive spells. Pyrelord and Controller’s spell “Controlled Ignition” now properly applies. Pyrelord and Controller’s spell “Controlled Ignition” can now trigger reactive spells. Coalescence of Fire have had their health reduced and now cast a change target spell. Players using the cannons to cross the gorge are no longer allowed to be mounted. 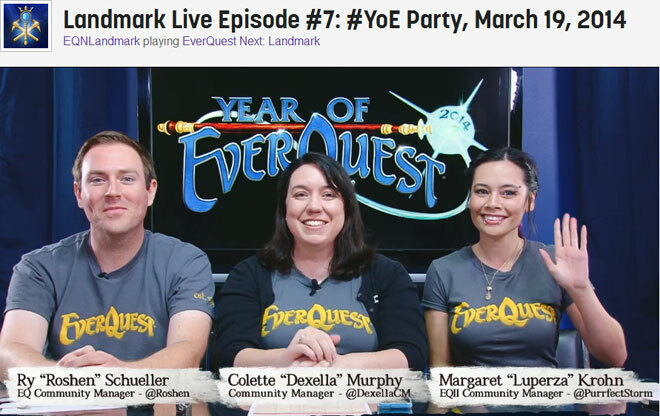 Community Managers for EverQuest (Ry “Roshen” Schuller), EverQuest II (Margaret “Luperza” Krohn), and EverQuest Next & EQN Landmark (Colette “Dexella” Murphy) held a webcast on Twitch today to talk about the Year of EverQuest, including updates about the franchise, and with specific news about each game. First up, Simon Cox, Director of Programming at Wikia was on the phone to announce a new feature from Wikia that ties all the EverQuest games together. Developed in partnership with SOE, the new site called EverQuest Portal is a cross-game metasite for the entire franchise. To promote this new feature, Wikia is holding a sweepstakes to give away 10 product keys to the EverQuest II: Tears of Veeshan expansion as well as Trailblazer (alpha/beta) keys to EQNext Landmark. All EverQuest 2 Servers will come down on March 20th, 2014 at 7:00 AM PDT for an update. The expected downtime is approximately two hours. Speak to Loremaster Dorondal in icy Thurgadin. He has many treasures to offer, and among the most valuable lies Zlandicar’s Heart. If you can find what he’s looking for, the Heart will be yours! High among the cliffs of Steamfont, a gnome sits, wondering at his fate. Unable to descend the sheer rock wall, he puts pen to paper to ensure his story is told before the elements – or worse – take him from this world. To follow in his footsteps is to put oneself in grave danger, but the pull of the Hero Bracers cannot be denied! Note: Portions of these quests will require the Tears of Veeshan expansion to complete. Editor’s Note: These quests can be completed through grouping, although raiding may provide a chance at a better version of the reward. It’s Brewday once again in Norrath, and there’s nothing like the Dwarven celebration of Brell and beer to bring your spirits up! Adventurers across Norrath are invited to sample exotic brews, complete festive quests, and visit the mysterious Bar of Brell. Beer Tokens: Better than real money (because beer! ), this special currency is a new quest reward option and can be used to purchase event-exclusive items. Brewday Recipes: Take a break from drinking to craft some brand new Brewday items! Balin Copperfoot in the Bar of Brell has copies of “Brewday Accouterments to Craft V,” as well as previous editions. New Quests: There’s some strange noises coming from below the Bar of Brell, and it’s not the band, the brawlers, or the boasting patrons. Speak with the bartender to learn more! Brewday Bounty: Visit merchant Balin Copperfoot in the Bar of Brell for seven new Brewday items. 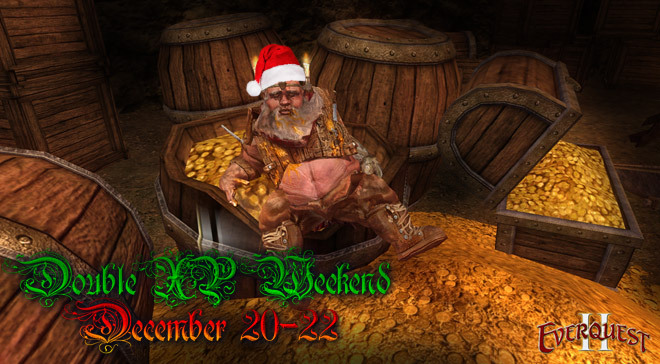 The festivities of Brewday returned to Norrath today and will run through March 17th. Brewday kicks off on March 6th and your faithful ZAM staff has been working hard to bring you all the help you need. While drunkenly stumbling through the Bar of Brell we helped Mraugl Stonecrusher investigate the strange noises under the bar andserved a lot of drinks! In the Butcherblock Mountains the pesky goblins trying to ruin the local Brewday festivities can once again be gleefully knocked over by clover carpets. The event also features a new crafting scroll, Brewday Accoutrements to Craft V, and a new Beer Token currency good for wares from Balin Copperfoot! Back by popular demand we also offer you our updated Brewday Quest Tracker! Happy drinking! Brewday launches in a couple hours, and I am finally finished the story that goes along with my Brewday 2014 Preview. Yep, I am cutting it close to the wire, but I had a really good excuse. Truly! Enjoy the festivities, and remember that the event ends at the end of the day on March 17th (St. Patrick’s Day). Get ready to go forth and earn yourself some Beer Tokens, and remember to send out your improved pack pony for holiday harvestables, if you have upgraded him! Erollisi Day 2014 Goes Live! Erollisi Day went live this morning, and ZAM and EQ2Traders have already posted their guides with the new event information. Erollisi Day is an annual Live Event which coincides with the Valentine’s Day holiday. It is held in honor and celebration of Erollisi Marr, the Goddess of Marksmanship and Love and sister of Mithaniel Marr, the Truthbringer. The Sisterhood of the Erollisi, along with Aaronolis Swornlove, are active participants in the act of spreading her word of love. Should you need a hand looking for roses to give away, sorting out the Chronomages, or making a new topiary, we’ve got it for you at ZAM! Erollisi Day Guide at EQII ZAM! What does the racket of a barrel full of goblins have to do with Erollisi Day in any way, shape or form? My Muse seems to think they go together in Curtain Call, the short story to go along with the E-Day preview. Erollisi Day officially kicks off at midnight Pacific tonight (well, one minute after midnight, but close enough! ), so get ready for love notes, hard candies, roses galore, and … curtains! This is last chance to brave the chilly winter wonderland and save Frostfell if you haven’t. Spend your Frozen tokens to stock up on decorating items or grab one of the other unique items available on the vendor but do it soon! Finish up your holiday shopping and clear your calendar as this weekend starting Friday, December 20th at 12:00 PM PT you’ll get double experience from Adventure, Tradeskill, Alternate Achievement, and Guild Experience! This event will run through Sunday, December 22nd at 11:59 PT. Also, to help everyone ring in the new year and finish out Frostfell, we will have a 50% Rebate Sale on many of our items on Tuesday, December 31st at 12:00 AM PT to Wednesday, January 1st, 11:59pm PT. You only have two days so don’t miss out on this great opportunity! UPDATE: As per the revised announcement, this is a TWO day event. Gifts and Goblins: Frostfell returns to Norrath! 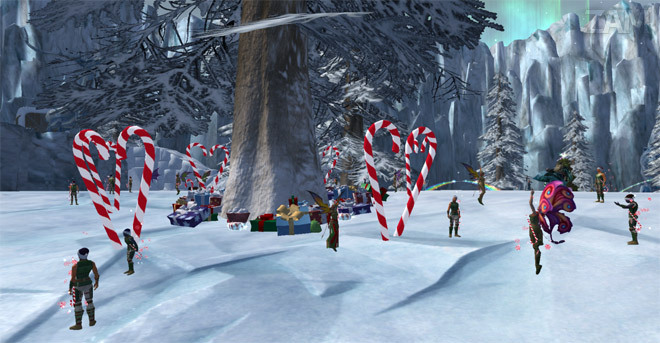 The weather may be wintery, but the denizens of Norrath are full of holiday cheer! The annual celebration of Frostfell features gift giving, fabulous feasts, holiday crafts, and of course, Santa Glug and his helpers. Interested in joining the fun? Travel to the Frostfell Wonderland Village by finding a magical wardrobe in Qeynos Province District, Freeport, Haven, Kelethin, Neriak, Gorowyn, or New Halas. Frostfell will begin December 12, 2013, and run through January 9, 2014, so bundle up and join the fun! What if someone could take a screenshot of every item that could be placed in a House, Guild Hall, or Dungeon, and then provide information about where that item is acquired, either from a Merchant, Recipe, or Quest. Well you don’t need to wish any longer because such a site exists. Lera’s EQ2Furniture.com is a comprehensive catalogue of every house item in EQ2, with screenshots from multiple angles, as well as data on how to acquire each item. The vast majority of this information was hand-entered, so this has surely been a monumental undertaking. Finally, a much-requested feature of diehard crafters and lovers of all things Frostfell, permanent Frostfell Crafting Stations. If you want to discover these on your own, then don’t read the article below!! 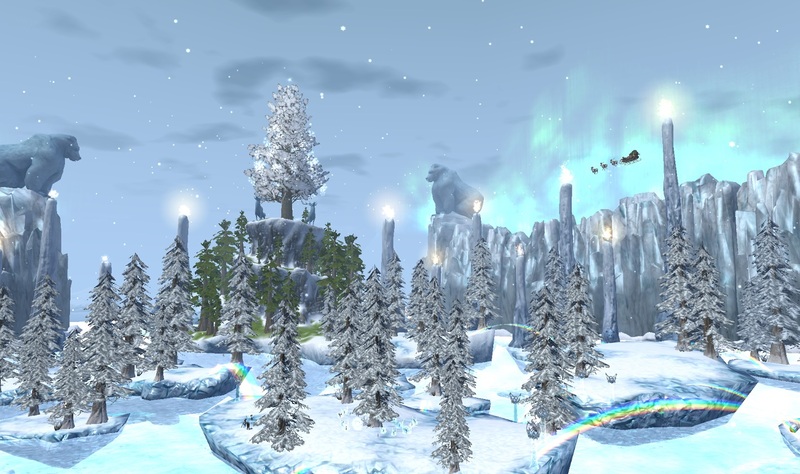 EQ2 ZAM: Frostfell Returns to Norrath! The season of giving and cheer has arrived! Frostfell will begin following the downtime on Thursday, December 12, and this year brings about a festive season of change. This year Frostfell introduces one new quest, A Deepice Mystery, which explores the altered Frostfell Wonderland Village and must be completed before several older quests may be obtained. Many new craftables are available to tradeskillers this year, resulting in items such as Gingerbread Plushies and a Glacier building block set. Several returning quests have new reward choices or tokens added to them. Players with extra “gifties” from the Gigglegibber Gifty Storehouse can exchange them for Frozen Tokens of E’ci on the Enchanted Lands dock. Santa Glug can be found with his bag of goodies inside the Frostfell Wonderland Village for players to receive their daily presents. Crafters can finally rejoice as they obtain the first ever Permanent Frostfell Crafting Stations! ZAM is pleased to offer alt-a-holics an updated Frostfell Quest Tracker. Print it out and chart up to 15 of your characters’ progress. We also have an image gallery of the new zone which you can see by clicking on the image below. Happy Frostfell!